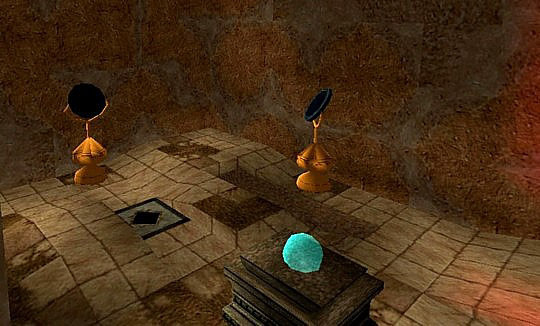 If you have played TR4 you may remember that in the Tomb of Semerket there was a puzzle which involved pushing three movable objects into beams of light. This in turn switched off three light beams in a room below, which were now deflected by mirrors onto a casket in the middle of the room. Once all the beams had been reflected, the casket slid aside to reveal a passage underneath. For my level 'The Scroll of Destiny', I created a new puzzle based on those mirrors and light beams. 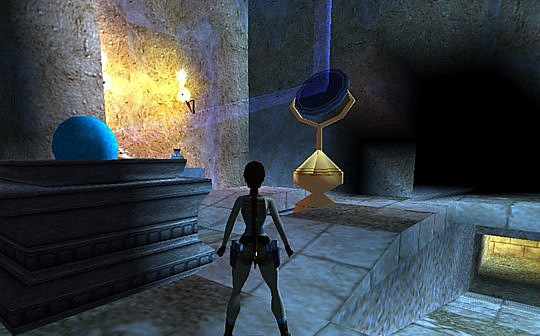 In this version, as Lara enters the gem room where she will place the Gem of Light into its puzzle hole, a camera cuts away to show the room containing the mirrors as seen in this screenshot. As yet, there are no light beams visible in this room and the Orb in the centre is opaque. 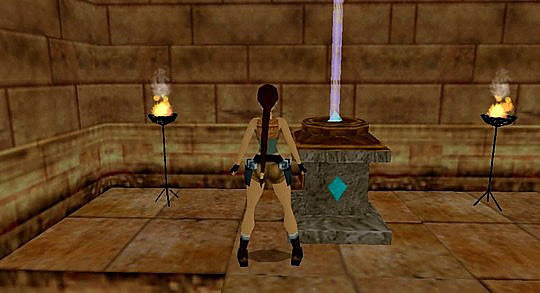 Back in the gem room Lara now places the Gem of Light and a vertical beam appears. Now let's see what happens as each mirror is moved into those light beams. The mirrors deflect the beams onto the centre Orb. After all three beams have been deflected onto the Orb, it becomes semi-transparent and a door opens. Ok so that's got the background to it out of the way. Let's take a look at how it was done. The light beams from the original puzzle used waterfall slot 1 for the angled beam and waterfall slot 2 for the vertical beam. These were copied into the same slots and a custom version of the mirror was copied into a pushable object slot using Wadmerger. The requirement for this object was that a vertical beam of light would appear when the puzzle was solved. Easy enough you might say, just use the waterfall 2 object, with the invisible button in its ocb setting's box pressed. Trigger it using a key trigger placed under the puzzle hole, that way it will become visible once the puzzle is solved. This is where the first problems raised their ugly heads!!! 1. The waterfall 2 object flows downwards, but I wanted the light beam to appear to be flowing upwards. 2. I had already used up the available waterfall slots. These problems were overcome by creating an additional waterfall object in one of the animating slots. Thanks to Titak for this tutorial showing how it's done. There were several requirements for this room. 1. The player had to be shown the room before it was accessible and before the light beams were visible. 2. Once the Gem of Light was placed, a flyby would show that three vertical light beams had appeared. The entrance door to the room would also be triggered by the camera. 3. As each mirror was placed under its corresponding light beam, the beam would be deflected onto the Orb on top of the central casket. 4. After all three mirrors were in place, the Orb would become semi-transparent and the exit door would open. This posed a problem because of the waterfall objects being triggered by the game engine. 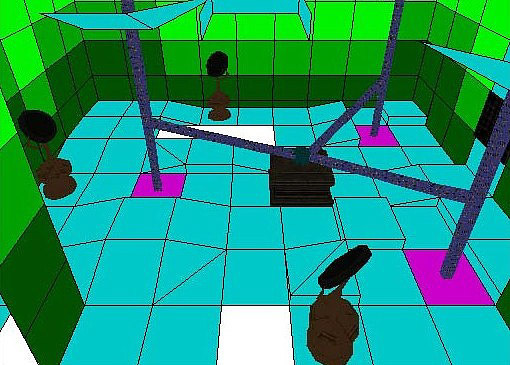 The solution was to make a copy of the mirror room minus the waterfall objects. A simple camera triggered by Lara showed this room while a door prevented access to the real mirror room. This just needed a flyby camera sequence triggered by placing the Gem of Light. 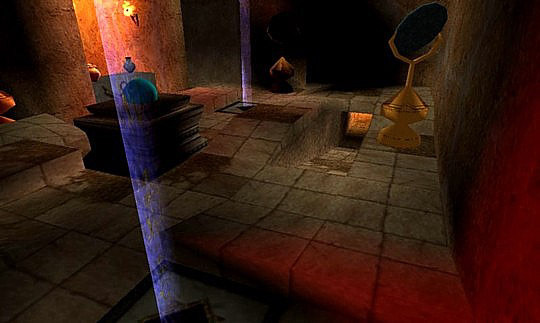 The sequence showed the player the route to the real mirror room; a heavy trigger under one of the cameras triggered the entrance door to open, and the sequence ended by showing the three vertical light beams. 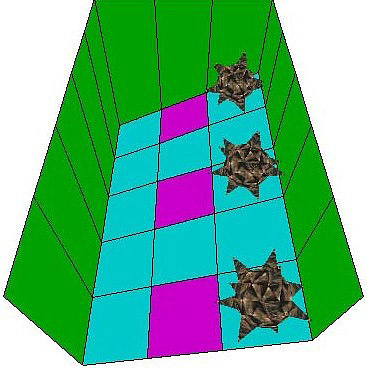 This gave the player the impression that the light emitted from the puzzle hole was being channelled into the mirror room. That's easy, place a vertical and an angled light beam onto the same floor tile and trigger them on and off at the appropriate time. Easy peasy? Think again!!! A straightforward trigger/anti-trigger will not work unless the beams have very specific settings in their ocb boxes. These are initially on and will be triggered off. These are initially off and will be triggered on. Heavy trigger for the vertical beam above. Trigger for the angled beam above. Trigger for a rolling ball associated with this pair of beams. Now as each mirror was placed into position, the vertical beam would be replaced by the angled beam and a rolling ball would be triggered. More about these rolling balls a little later. This shot shows the layout of the objects & the position of the triggers. This involved two versions of the central casket placed onto the same floor tile. One had an animation to make it drop below floor level when triggered, and had an opaque dome, this was the one seen before placing all the mirrors. The other had a semi-transparent dome and was set invisible in its ocb settings box. When all the mirrors were placed in position both caskets were triggered. Of course, the player could not see this change of object taking place, giving the impression that the dome had reacted to the light beams. The two caskets and the exit door needed to be triggered only after all three mirrors were in place. This is done by using the code bits in the triggers for these objects. Unfortunately, however, if these triggers were placed with the triggers under the beams, they would affect every trigger placed on the same tile. This is where those rolling balls come into play. As each mirror is placed into position it triggers a rolling ball, which passes over stacked triggers. These stacked triggers are Trigger for casket A, Trigger for casket B and a Heavy trigger for the exit door. To ensure the caskets were swapped and the exit door opened only after all the mirrors were placed, each heavy trigger for the exit door had different code bits set. In this way each mirror only supplied part of the final trigger needed for the caskets and exit door. As you can see, what started out as a simple idea actually involved a considerable amount of work and more than a little problem solving. I hope reading this will inspire you to have a go.